For the fist time Data Cuisine was invited by a an organisation — MiCT — instead of an art institution, with the goal to develop a unique flying data buffet for a special event: the organisation’s 11th anniversary and the Open Eye Award ceremony. Media experts from MiCT, the chefs Sebastian Becker und Maximilian Haxel from bestecklos FingerFood Berlin, Moritz Stefaner and Susanne Jaschko (prozessagenten) collaborated on creating a flying Data Cuisine buffet that translates media related data of some of the countries where MiCT works into a culinary experience. It was a truly challenging assignment. We started with a brainstorming in order to identify some of the areas that MiCT wanted to focus on. 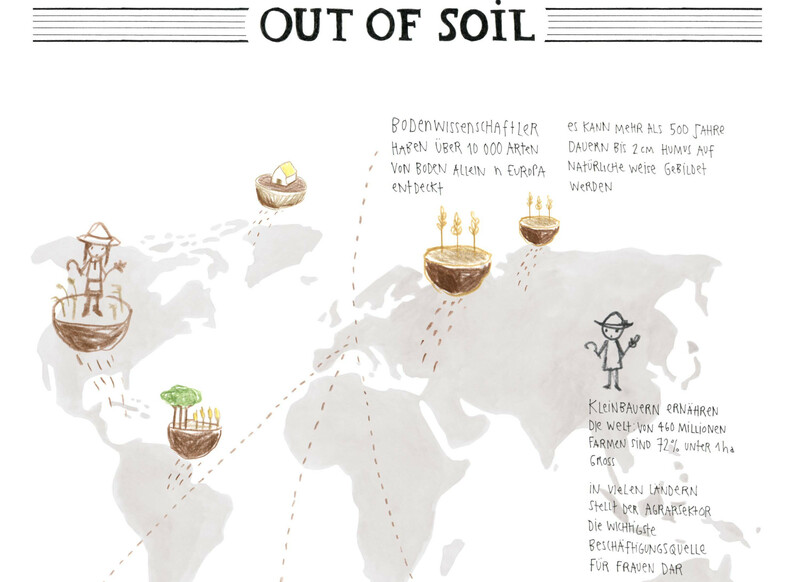 The second part of the workshop was about whirling around ideas, casting them away, picking them up again and getting our hands dirty and — after all of this — ending up with something that is not only edible but also tells a data story. 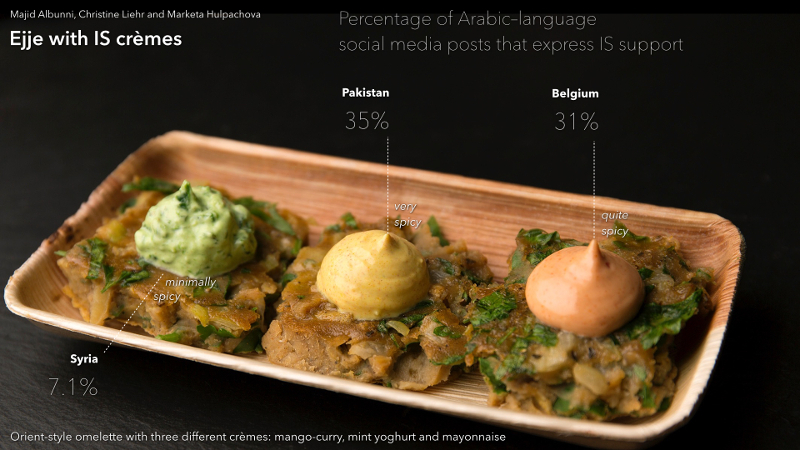 Each of the dishes represents another surprising set of data — each tells a story or poses interesting questions about the media use and the media landscape in North Africa, the Near East or Cuba. On the night of the event 200 guests experienced the seven data dishes and and were surprised not only by the facts and stories but also the unusual method of data representation. In Tunisia, the number of Facebook users is very high, whereas in Egypt it’s much lower. 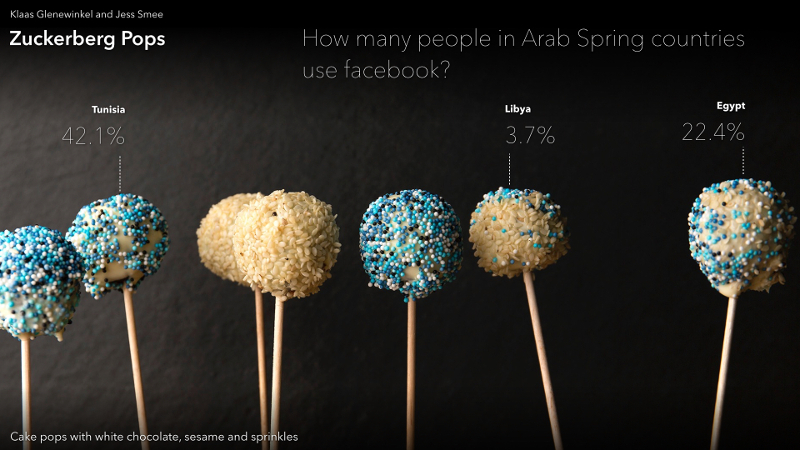 These numbers makes us wonder whether there is indeed a connection between the use of Facebook and the results of the Arab Spring. In Tunisia, the Arab Spring had a sustainable impact on the democratisation of society, very much in contrast to the situation in Egypt, that fell back under totalitarian leadership. An omelet spiced with cumin and pepper, that’s popular in Syria. It comes with three different cremes: one based on mayonnaise, one being a yoghurt-creme with mint, and a mango-curry-creme based on white cheese. With these three cremes, the workshop participants Majid, Christine and Marketa tried to bring to our attention the somewhat surprising fact that support for Islamic State among Arabic-speaking social media users in Belgium are greater than in the militant group’s heartlands of Syria for example. In Syria, ISIS appears to be dramatically losing the battle for support with more than 92% of tweets, blogs and forum comments hostile to the militants. But the jihadist militants are successful at spreading their message and their efforts appear to be having an effect: outside Syria, support for Isis rises significantly. One can taste the grade of the ISIS support in the cremes. According to the numbers, red pepper was added to them. 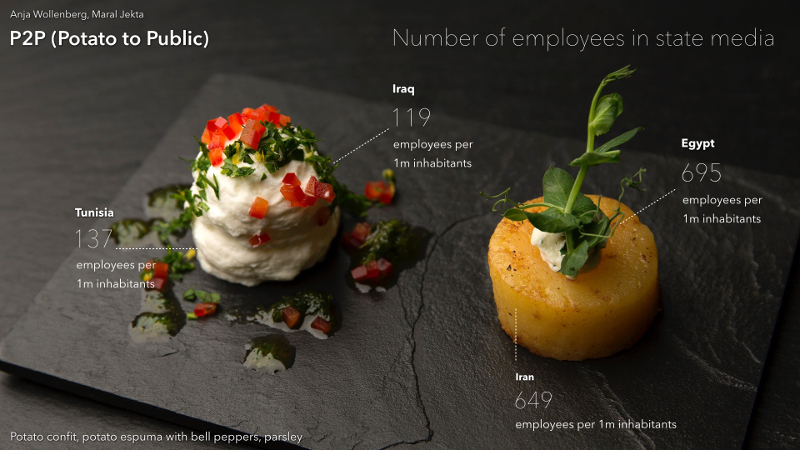 This dish combines two variations of potato and compares the numbers of employees in state media in Tunisia, Iraq, Egypt and Iran. In Egypt there are 57.000 people employed in state media, which is quite a big number — whereas in Tunisia it’s only a thousand. This dominance of state media of course influences the public sphere and seems to go hand in hand with the authoritarian rule in Iran and Egypt. Interestingly enough, in Iraq the number of employees is comparably low, and that speaks for a more liberal society than we might think or than we are told. To be discussed. Find all images and dishes on Data Cuisine. The press response was unbelievably positive after the last Data Cuisine workshop at Sonar/Big Bang Data Exhibition in Barcelona. We got covered by a lot of international design blogs like Trendhunter, Citylab, Core77, Fastcodesign, We Make Money Not Art, CNet, Desingbook etc and print magazines (Folio/Mexico, Page /Germany), and we even made it into the major Costa Rican newspaper La Nacion and Forbes Online. So what’s coming next for Data Cuisine? We aim for a few more editions of the workshop, in order to continue to explore the medium for data representation in conjunction with local cuisines. We are also considering varying the format in the future. Next to the current model — a workshop — we are sure that a high-end data dinner would work well. We found that the consumption of the food at the end of the workshops could have more emphasis or almost be developed as a separate event. A data dinner would not focus on the collaborative workshop process, but on the dining experience, in which the represented data would provide the topic for analysis and debate. A data dinner could have any topic that is represented statistically, i.e. society, economics, science, culture and politics. Imagine a group of politicians, managers or scientists that is served several courses of a data dinner representing main issues in their respective field in such a sensual and surprising way. We believe that experience would stir a very inspirational debate opening up new perspectives and lines of thought. When served the data dishes are not legible without explanation. Some look like ordinary dishes that reveal their meaning only by eating them. Others are very graphic and visual, but in general one has to be told what data they represent. In this way the dishes generate curiosity, which is already the ideal starting point for a discussion about the story and data ‘behind the dish’. 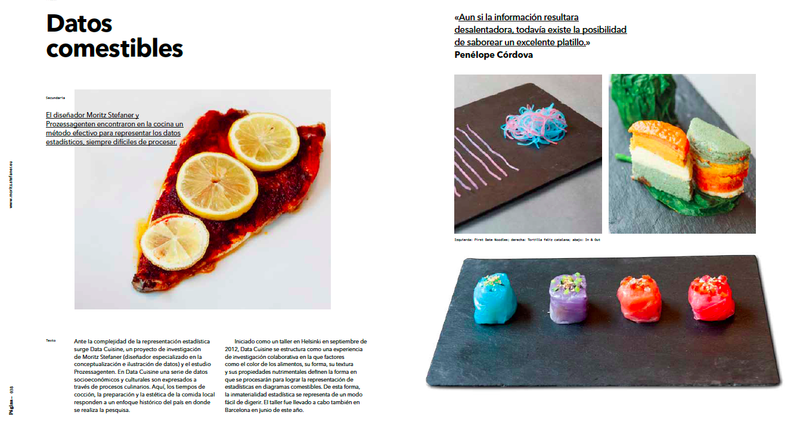 In its article on Data Cuisine, PAGE magazine recommended to anyone interested in it to request a workshop for his or her city. We add: any company, government or organisation that could imagine having a data dinner, please get in touch, too. For the whole link list of press articles go to the project site. How does a tortillaÂ taste whose recipe is based on well-being data in Spain? Would you rather like the cakeÂ based on the science fundingÂ 2005 or in 2013? Can you imagine how a fish dish can represent the emigrants from Spain to countries across the world? 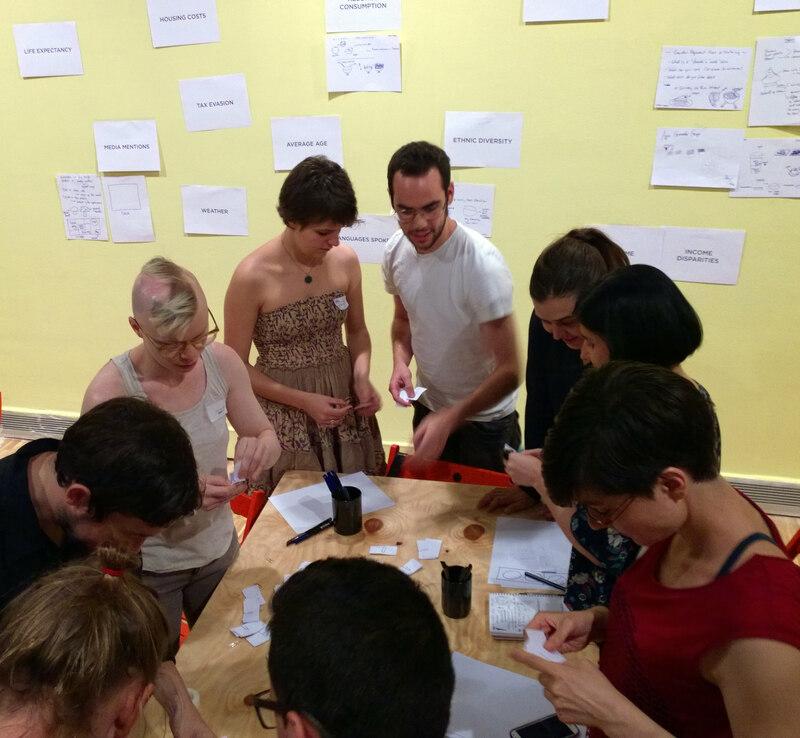 The second Data Cuisine workshop took place in Barcelona on June 10-13, 2014 as part of the Big Bang Data exhibition at CCCB, and in coordination with Sonar. For the culinary side of the project, we collaborated with Sebastian Velilla, a fantastic chef who has worked for the Alicia Foundation and is currently involved in the activities of the Torribera Food and Nutrition Campus of the University of Barcelona. 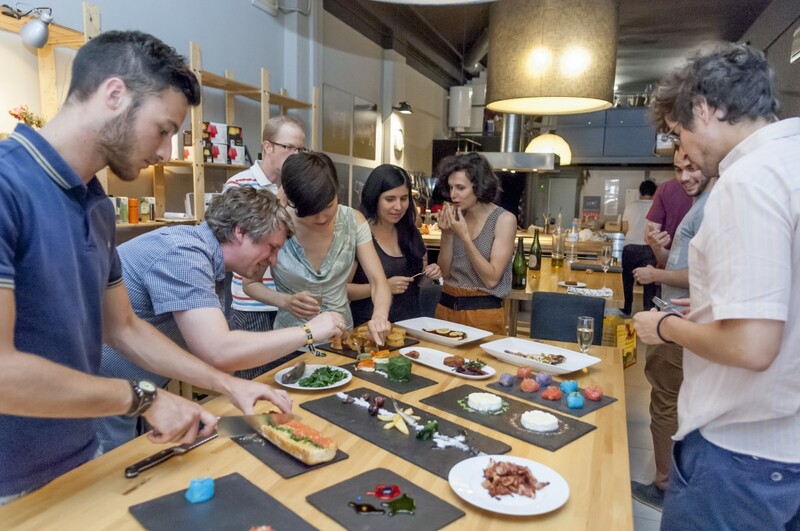 On four afternoons, twelve participants explored data of Barcelona, Catalonia and Spain with culinary means. The first two afternoons were about getting into the methodology and coming up with quick ideas how to represent topics and data with dishes. We got some inspiration from our exclusive visit to Ferran Adria’s BullipediaLab, an emerging space dedicated to the research of food creativity. 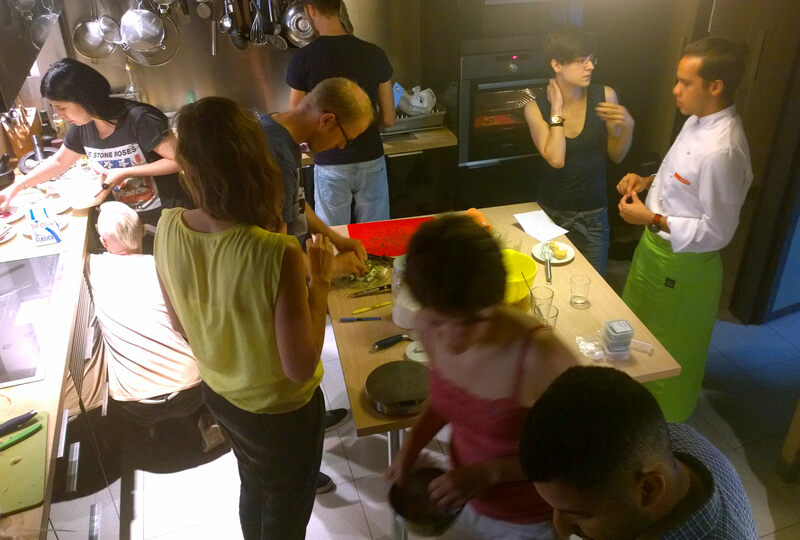 We spent the second half of the workshop in the kitchen, where the participants refined their recipes and made first tests and prototypes. On the last day, the participants, of which many worked in groups of two or three, produced their final dishes. The workshop ended with a presentation and tasting of all data dishes. Thanks go to Jose Luis de Vicente and Olga Subiros for bringing us over, and our fantastic participants, especially Luis Fraguada, who brought a food printer, which we will surely hear more of in the future. All results of the Barcelona workshop and more images can be found on the Data Cuisine website. You can also follow us on Facebook or Twitter. 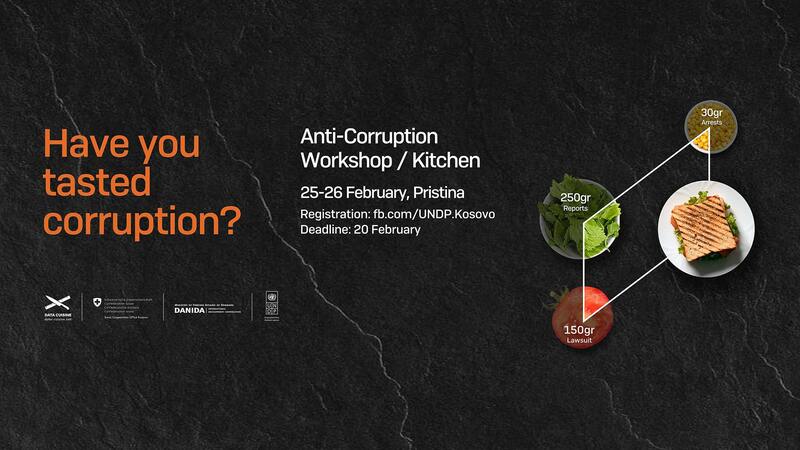 The Data Cuisine workshops are led by prozessagent Susanne Jaschko and Moritz Stefaner.